Need new apps for your favorite device? Here are 29 iPhone, iPad and iPod touch apps that just hit the App Store. 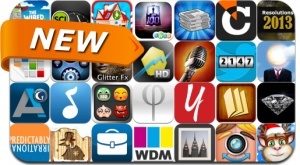 This new apps alert includes Video Poker, 1 vs 100, Resume Pro, The quiet place, Countdown, Auto Glitter FX, Faces With Friends, System Util Dashboard, Sticker Pro, Resolutions 2013 and many others. Video Poker HD – Jacks or Better!